According to the 2015 Retail Sector Benchmark Report, 46% of retail companies are planning on increasing their training budget in the next couple of years, compared to 35% average across all businesses. Why should the retail sector invest in elearning? 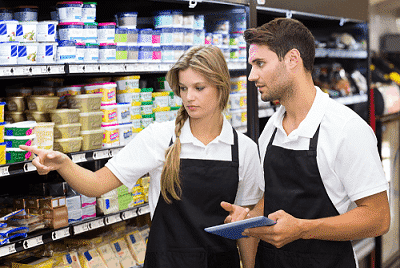 Staff turnover in the retail sector is one of the highest with an average of 40%, and with the cost of hiring and training a new recruit reaching several thousands pounds, it is vital for organisations to retain their staff. Well trained employees who understand the products and processes before they are let loose on the shop floor are more likely to understand their responsibilities, be happier and therefore stay longer. eLearning is an easy, engaging and cost effective way to onboard and train new employees. Online training allows staff to immediately access training materials on new products, sales campaigns and flash promotions whenever they need it. Prior to elearning, head offices had to prepare and print training materials and book time out of the working day to provide face-to-face training. However, with the advent of online training, staff can now be kept up-to-date quickly and efficiently at the touch of a button saving weeks of preparation and increasing staff knowledge instantly. Customers are more likely to buy a product from well informed staff. If the sales staff know the products, their features and benefits, and they share this knowledge with the customers, then they’ll have more confidence to buy. The same goes with customer service skills. Customers will go back to a shop and offer repeat business if they have received good service. Mobile learning also brings added value as staff can easily and instantly access information on the floor giving them the ability to advise the customers at once, again increasing customer satisfaction levels. The use of elearning means the need for printed material, on-site trainers and off-site training days is greatly reduced, bringing down the training budget which can then be spent on higher quality content. Additionally, staff are more likely to be more engaged with the course and retain the information more effectively as they can carry out the training at their own pace and where they want (home, break room, bus…). The content of the courses can also be fully tailored to each individual or job role so that staff do not have to sit through courses they don’t relate to. Utilising games in elearning content increase staff’s engagement, completion rates and retention of information and they are particularly popular with the younger employees. In the shape of very short fast-paced modules, they also allow employees to be trained quickly preventing them to be “off the floor” for too long which is encouraged by sales managers. eLearning platforms can be used for social learning where staff can share their experience and knowledge, upload photos and videos and learn from one another. If a new shop window in Manchester is bringing a lot of customers through the door, staff can share a photo of their work on the social platform for other shops to implement. Webanywhere has created a video based learning platform for Inditex, the brand owner of Zara, allowing staff to share best practice. You can read the case study here. If you are in the retail sector and you think that elearning could help with your daily challenges, contact us now to discuss your requirements.